1. What is Action Methods in ASP.NET MVC 5? 3. How many types of Action Methods in MVC? In the last chapter, you have seen an ActionResult method that returns Index() view page to the user. 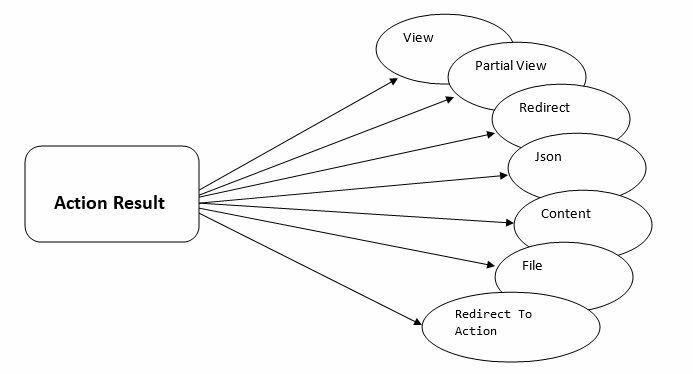 In this chapter, we will clear the concept of Action Methods in MVC. What is Action Method in ASP.NET MVC 5? All the public methods which are written inside a Controller are known as Action Method. When creating Action Method you must follow these rules. a. Action method must be public. b. It cannot be overloaded. c. It cannot be a static method. d. Every controller has at least one default Action method Index() that returns the view page. e. ActionResult is a base class of all the result type action methods. ActionResult is the base class of all the result type action method. 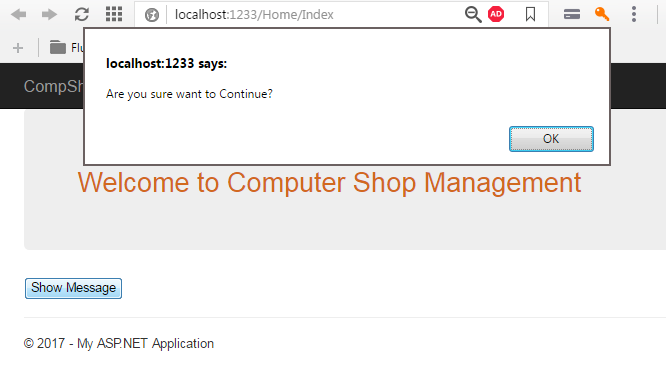 There are following Result type action method in MVC. ViewResult - Represents HTML and markup. EmptyResult - Represents no result. RedirectResult - Represents a redirection to a new URL. ContentResult - Represents a text result. 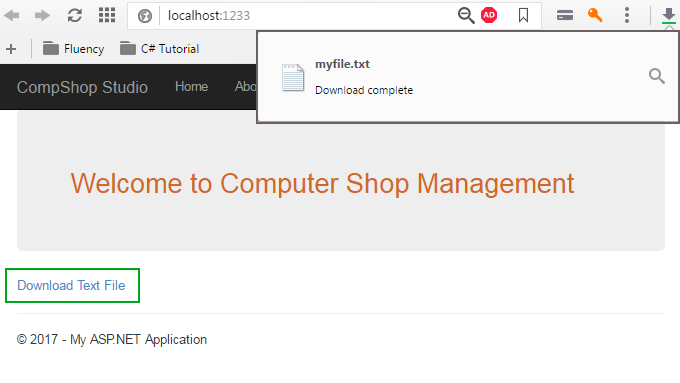 FileContentResult - Represents a downloadable file (with the binary content). FilePathResult - Represents a downloadable file (with a path). FileStreamResult - Represents a downloadable file (with a file stream). Output: It will return a blank page with no result. Redirect Results is used for returning results to specific url. When you need to redirect to another action method, you can use RedirectResult Action Method. When you will run this code, It will redirect you to Contact Page. JSON Result returns simple text file format and key value pairs. Sometimes you may want to return data in JSON Format and that situation you JSONResult is the best option. Step 2: Open Index.cshtml and add the following highlighted code. It returns user-defined content type. It is useful when you want to send some plain text message to browser screen. It represents the content of the file. Step 2: Add Action Link in Index.cshtml page. Returns HTML from Partial view. Step 1: Add a partial page. Go to Solution Explorer Shared. Right-click on it and select Add View. Step 2: Create partial view page as described in this picture. Step 3: Add the following code in message.cshtml page. 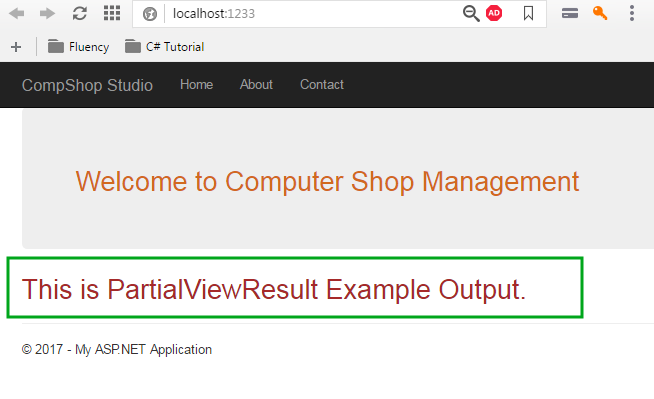 This is PartialViewResult Example Output. Step 4: Open HomeController.cs and add following line of code. Step 5: Go to Index.cshtml and add this code. In this chapter, you learned several types of Action Methods. 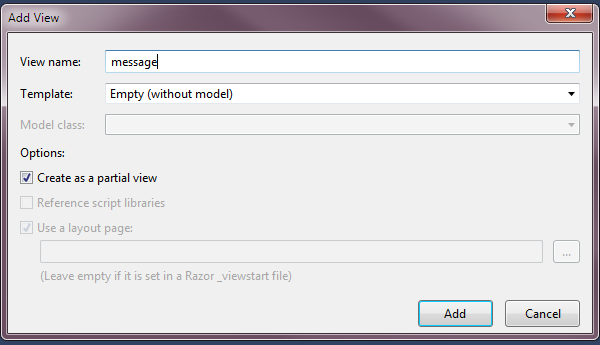 In the next chapter, you will learn about Views in ASP.NET MVC 5.